It's no secret that boomers fearing an underfunded retirement have sharply cut spending. However, it's not just boomers cutting back. Consumer attitudes toward debt have changed across all age groups. A recent Gallup Poll shows just how dramatic a spending shift has taken place. Please consider Boomers’ Spending, Like Other Generations’, Down Sharply. Baby boomers' self-reported average daily spending of $64 in 2009 is down sharply from an average of $98 in 2008. But baby boomers -- the largest generational group of Americans -- are not alone in pulling back on their consumption, as all generations show significant declines from last year. 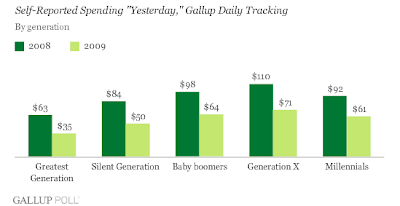 Generation X has reported the greatest spending on average in both years, and is averaging $71 per day so far in 2009, down from $110 in 2008. The chart shows Boomers and Generation X are the two demographic largest groups. Spending is down by 34.7% among boomers and 35.4% in Generation X. Spending is down by 33.7% in generation Y, the third largest demographic group. That is a remarkably consistent decline in spending. Spending by the "Greatest Generation" is down a whopping 44% but that group only constitutes 5% of the population. Here are some more interesting charts from the article. Surprisingly, annual incomes are nearly identical for boomers and generation X. 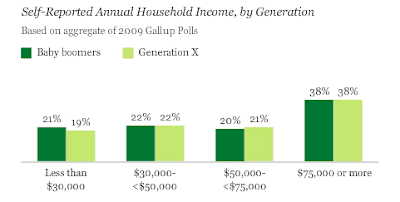 However, Generation Y income is dramatically less as the following chart shows. I can add to those thoughts. Boomers and Generation X are loaded to the gills with debt. Boomers in particular are downsizing and income growth is stagnating across the board. Moreover, boomers headed into retirement are scared half to death about insufficient funds. Those boomers are not about to go on a spending spree. Please consider the Incredible Shrinking Boomer Economy. Those stats are from a McKinsey study, and there is nothing remotely inflationary about boomer demographics. Nor is there anything inflationary about Generation X demographics. Generation X's have seen boomers blow it. By sharply curtailing spending, generation X at least has chance to right the ship before retirement. It's too late for most boomers. Time ran out. Now consider generation Y with 19% of the population. Think the income levels of generation Y are going to catch boomers or generation X? Finally, think about tightening lending standards and attitudes about debt in general. Because of lower incomes and tighter lending standards, it is unlikely that Generation Y will be either able or willing to carry debt burdens to sustain a strong recovery. Here is a simple analogy that everyone should be able to understand: You can lead a horse to water but you cannot make it drink. And if the horse does not want to drink, it was a waste of time and energy to lead the horse to the water.